This cd usb drive is simple to use. With an emergency touch control on the upper right corner, it will be much easier for you to eject the disk. This USB external slot CD RW burner can read CD/DVD, and burn CD. 1.Cannot recognize the Driver or read the CD/DVD: Pls hook up the usb cd drive to the direct USB port on your computer. If you connect it to a USB hub or extension cords, it maybe cannot recognize the Driver or read the CD/DVD. 2. Cannot be recognized by computer: Ensure cd is placed well and not scratched. Ensure there is a build-in practical driver software. 3.Insufficient power supply:When you connect the external usb cd drive to the desktops, please connect it with the computer's motherboard to avoid of power shortage. Brand new from Ploveyy® ,Plug and Play Features; NO Driver Program or Extra Power Supply Required. 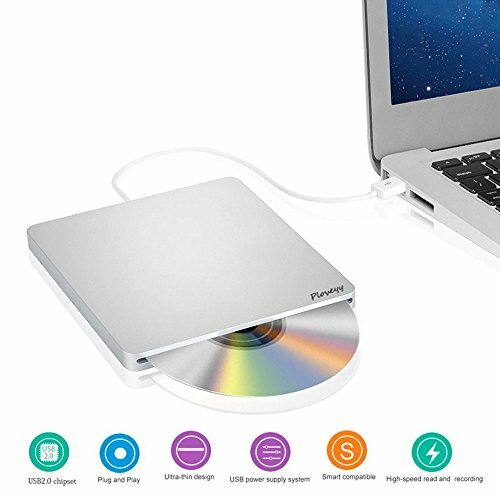 Premium Quality Portable Lightweight Ultra Slim External Optical Drive USB 2.0 External Slot CD RW Superdrive SATA CD DVD Drive / CD Burner for Apple MacBook Pro, Air, iMAC, Ultrabook, Netbook PC. Use this superdrive to record and play music or movies, install software and back up files from your computer. Will work with Windows XP / vista / windows 7, Windows 8, Windows 10 and with all version MAC OS. Needs to Install Driver (included) for Windows 98 / SE / ME / 2000.